The President is well-known for gobbling up taxpayers money for his personal benefit, but a Sunday newspaper called him a chicken yesterday and for good reason too. Jacob Zuma was labeled South Africa’s Number One Coward for refusing to answer questions in Parliament simply because it’s getting much tougher to defend the indefensible. Scandal seems to follow him around like a mosquito on steroids. To make matters worse, his spokes-idiot Zizi Kodwa defended him by saying “The president can’t go to parliament when that parliament is a circus.” People have been calling the ANC-run parliament a circus for years, and it’s pretty darn hilarious that they agree. If it was at all possible to take things from worse to rock bottom, you can count on Zuma to comply. At a Press luncheon over the weekend, Zuma asked if it was unfair for him to squander spend nearly a quarter of a billion rands on sprucing up personal residence at taxpayers expense when an airport was constructed nearby former apartheid era President P.W. Botha’s home for his apparent exclusive use. Not only was the comparison disingenuous, the dufus failed to realise that defending his wastage by comparing it to another cretin’s wastage, was the worst possible thing to do. This self-serving clod, never misses an opportunity to remind the sheeple how terrible the apartheid era sins were, while never missing a chance to repeat them himself. While credulous voters continue to abide this disgraceful specimen, it will be gobble, gobble, until the country is properly ruined. 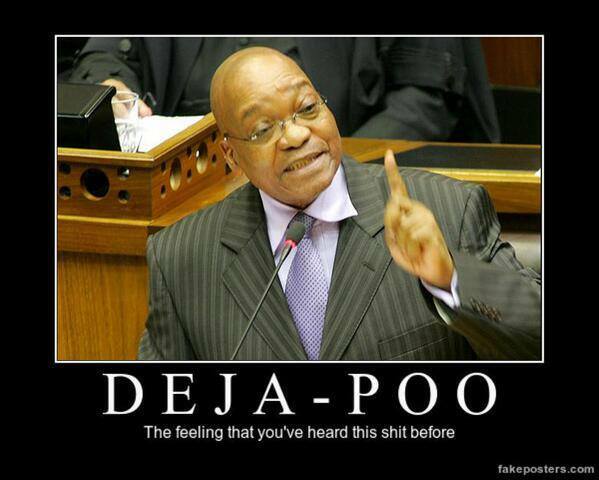 This entry was posted in Humour, News and Politics, South Africa and tagged Apartheid, credulous, Jacob Zuma, Number One Coward, P.W. Botha, scandal, South Africa, Zizi Kodwa by lennymaysay. Bookmark the permalink.